Well the hole in my finger is repairing rapidly. I usually stop sewing before too much damage is done. 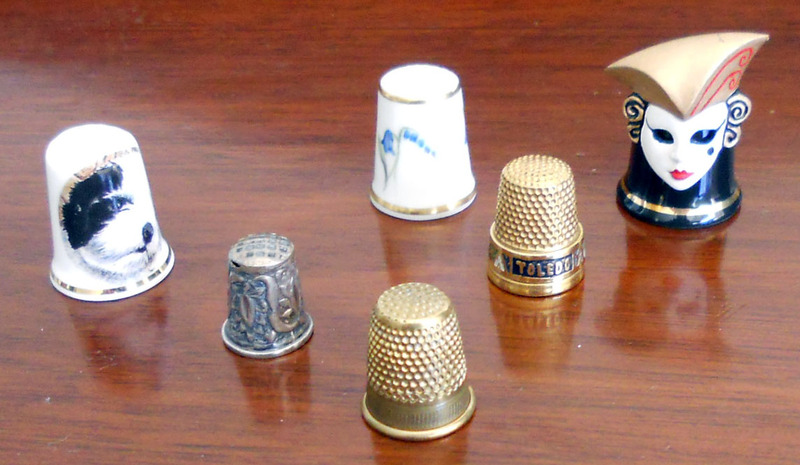 So I got out my thimbles today. Mostly they are just decorative . The one in the centre front is the only one I can use and the silver one is a child's thimble which I bought in an antique shop. Perhaps tonight I'll work using a thimble though it slows me down a lot. It has been a perfect autumn day and the local primary school had its annual walkathon. They go round and round a decent-sized block, so no roads have to be crossed, with the number of circuits depending on which grade you are in. They went right past my house and it wasn't long before I came to the conclusion that some of the staff and parents accompanying the children aren't used to distance walking ! The children were much fitter.